“Our Kitsap delegation including Congressman Derek Kilmer, Sen. Christine Rolfes, Rep. Drew Hansen, and Rep. Sherry Appleton have all engaged with the Department of Ecology and the Governors’ office. “Additionally, a new DOE director Maia Bellon took office around the same time as the newspaper story broke. She has spent a great deal of time coming up to speed on this project and met last Friday with Pope Resources CEO David Nunes. I’ve copied the newsletter into a PDF document (PDF 78 kb) for those not on the mailing list. 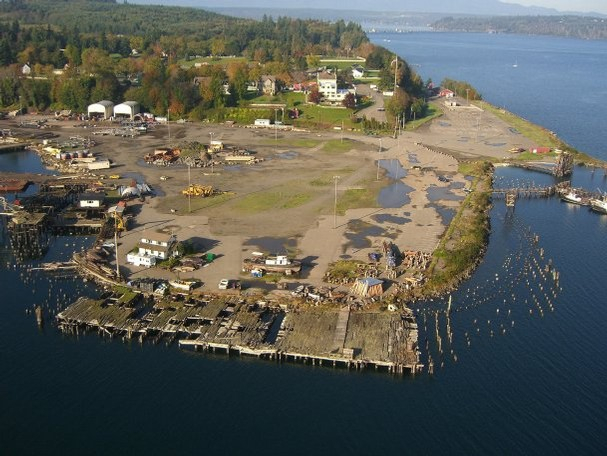 A proposed cleanup and restoration of Port Gamble Bay, worth somewhere in the range of $30 million, seems so close yet so far away this morning. It seems Pope Resources has come to an impasse with the Washington Department of Ecology, not over any aspect of the cleanup or restoration, not over a plan to buy waterfront property, not even over plans to restore the historic company town. The issue comes down to a couple of docks that nobody wants or needs, as I explain in a story in today’s Kitsap Sun. Pope wants to keep the two docks inside the bay until a new one is approved on the site of the old sawmill, just outside the bay. Although the legal aspects are not entirely clear, Jon Rose, who represents the company, told me that the old docks would help preserve legal access to the water, serve as environmental mitigation for the new dock and provide leverage and a backup plan if the new dock is not approved. If the deal can’t be put back together, Ecology will turn and focus on the cleanup by putting together an enforcement order against the company. The restoration plan, which has generated enthusiastic support from all involved, would be abandoned, leaving about $15 million in restoration work on the table. Most everyone involved — including those representing Pope and Ecology — have expressed disappointment that the parties have come to this impasse over a couple of docks that nobody really wants. Port Gamble Bay is recognized as important to the overall health of Puget Sound and to marine life around the Kitsap Peninsula. The bay remains one of seven inlets listed as the top priority for cleanup under the Puget Sound Initiative. That’s why nobody wants to believe a deal cannot be struck. Someone may have a real answer, but all I can see is that we need to find a way to jump to the endgame, something akin to traveling in a time machine. If everyone could agree to a dock that would meet the town’s needs without causing environmental harm and if the permits could be obtained practically overnight, then everything would be fine. But, of course, those two “ifs” are central to the problem. It reminds me of the impasse in Congress over the federal budget. Both sides are well-meaning. Both sides want to get things done. But they can’t seem to find a pathway to agreement without compromising their fundamental principles.